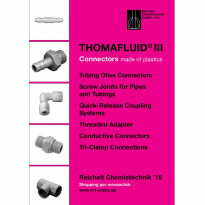 RCT Reichelt Chemietechnik presents a new handbook THOMAFLUID® III Connectors made of plastics. 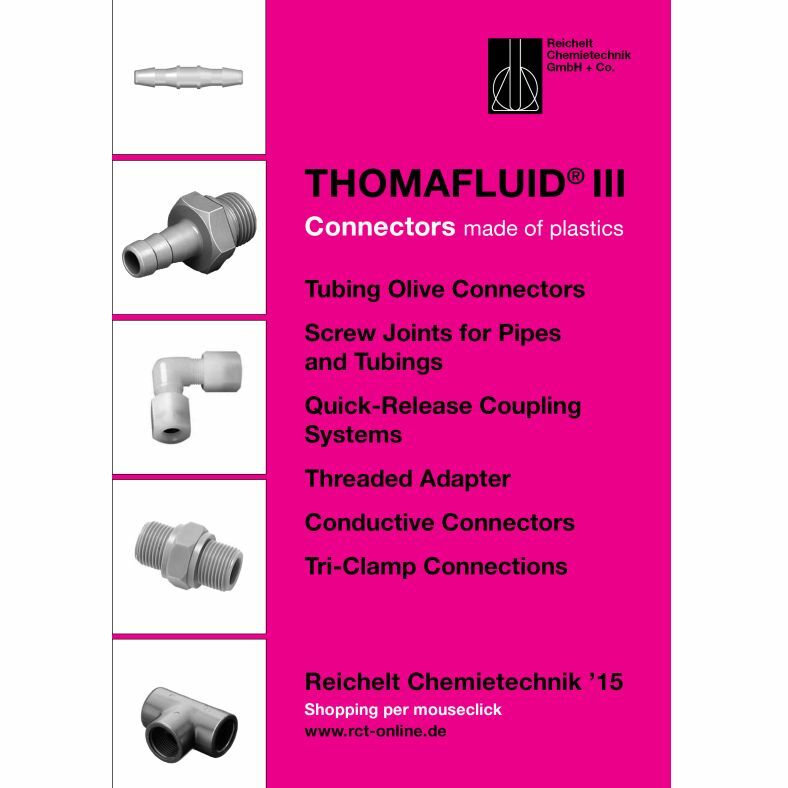 The handbook provides a user-friendly overview of the one-piece tubing connectors made of plastics available in the assortment of Reichelt Chemietechnik, which allows the prospect a quick selection of the desired type of tubing or pipe connector in the usual way from the previous handbooks. The handbook is divided into the following chapters: Hose nozzles, screw joints for tubings with an inside diameter between 1.6 and 12 mm, screw joints for fabric tubes with an inside diameter between 4 and 13 mm, screw joints for rigid tubings or pipes with an outside diameter from 0.7 to 32 mm, plug-in connectors for rigid tubings or pipes with an outside diameter from 4 to 14 mm, thread adapters, conductive screw joints and Tri Clamp connectors. In addition to an extensive specification of material properties relevant for the respective connection type, the handbook offers in particular intuitively comprehensible instructions for the assembly or disassembly of the different connecting elements which are also provided with a variety of diagrams and thus enable a smooth laboratory and plant use of the different connection types. In accordance with the philosophy of RCT Reichelt Chemietechnik proven and appreciated by experts for more than 35 years, all products from the handbook are available in metric and imperial dimensions immediately ex-stock without extra charge for small quantities. All products from the handbook are also to be found on the homepage of RCT Reichelt Chemietechnik, recently supplemented by new functionalities. Furthermore, the engineers of Reichelt Chemietechnik will be happy to answer any questions you may have on products from this or other handbooks. Please feel free to contact us at any time on +49 (0) 6221-31250.